(CNN) -- A large ice shelf is "imminently" close to breaking away from part of the Antarctic Peninsula, scientists said Friday. The Wilkins Ice Shelf -- a large mass of floating ice -- would still be connected to Latady Island, which is also part of the peninsula, and Alexander Island, which is not, said professor David Vaughan, a glaciologist at the British Antarctic Survey. That meant the "bridge" of ice connecting Wilkins to the islands was just 984 yards wide at its narrowest location, the ESA said. Further rifts developed in October and November, said Angelika Humbert of the Institute of Geophysics at Germany's Muenster University. "During the last year the ice shelf has lost about 1800 square kilometers (694 square miles), or about 14 percent of its size," Humbert said. Antarctica's ice sheet was formed over thousands of years by accumulated and compacted snow. 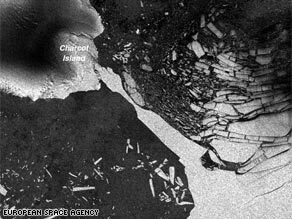 Along the coast, the ice gradually floats on the sea, forming massive ledges known as ice shelves, the ESA says. "It had been there almost unchanged since the first expeditions which mapped it back in the 1930s, so it had a very long period of real stability, and it's only in the last decade that it's started to retreat," Vaughan said.